Lovely ground floor three bedroom apartment located in Golf del Sur with a spacious south-facing terrace for all day sunshine. Only 100 yards from the sea and a minute's walk to the resort centre. This lovely apartment is set in one of the most picturesque and prestigous areas in Golf Del Sur. 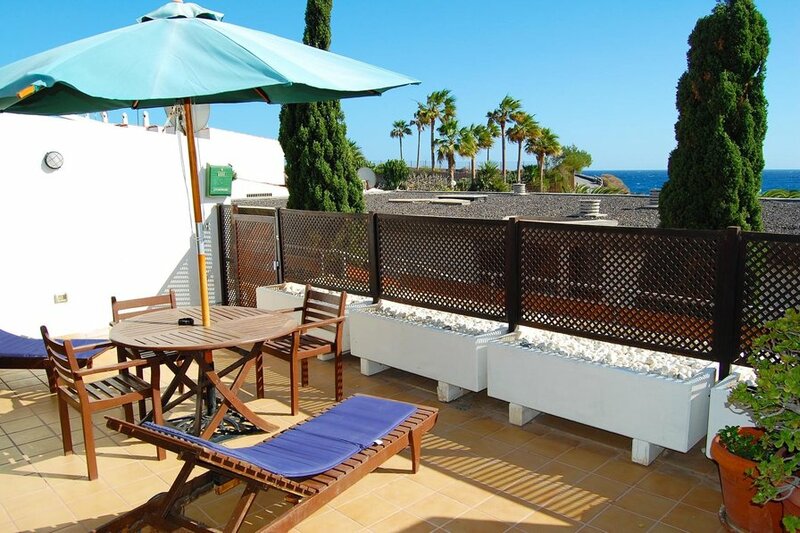 Just a few yards from the sea, and in a very tranquil area yet it just 2 minutes walk from the resort centre, the apartment could provide the perfect location for your next Tenerife holiday. Having been the subject of some recent modernisation all 3 ensuite bathrooms are brand new! It's a ground floor apartment set in a small row of completely separare properties (all privately owned) and not in a typical apartment block. Sleeping up to 6 people the apartment is deceptively large as it seems to go on and on as you walk through it! Air con is provided in all 3 bedrooms and the living room. Air con is optional and a supplement applies - please see pricing. Should air con not be required the units will be disabled. You walk in up to the apartment through the front gate and into the front sun terrrace. This is south facing, get's all day sun and has lovely sea views. It's literally only a 100 yards from the sea! The terrace is equipped with sun beds, a patio table and chairs. Patio doors take you into the living room, with two sofas, a coffee table and a large TV and DVD player. Satellite TV with various UK speaking channels (including movies and kids). You can look out from the living room over the terrace to the sea! The living room leads to the fresh kitchen which is particularly well equipped and includes a diswasher. A left turn out of the living room takes you to all 3 bedrooms. The master with a double bed (Queen size) and ensuite is set at the front of the apartment and also has patio doors leading to the terrace and those lovely views. The master has a new ensuite with walk-in shower. The 2nd bedroom has two twin beds and an ensuite with walk-in shower. The 3rd bedroom has a double bed and a single one too! It too has an ensuite with shower. There is also a separate large storage area, ideal for storing cases but also houses an iron, iron board and all the cushions for the sunbeds and chairs on the terrace. The apartment is just yards from the gorgeous communal pool right on the sea front. Only owners and their guests have access to this private area and it remains one of the most tranquil and exlusive pools in the area. The pool is heated in winter. From the villa, a 2 minute walk takes you to the resort centre. Here you will find 3 pretty squares each with their own selection of good quality bars and restaurants - many with evening entertainment. There are also shops, bank, doctors, chemists and much more! A lovely sea front walk takes you to the new marina in Golf Del Sur where there are more sea front restaurants to enjoy. Lovely ground floor front terrace (3 steps up to terrace) with gorgeous sea views. Sunbeds, Patio table and chairs. Gorgeous sea front heated communal pool - only the owners and guests have access to this area. 15 minutes from Airport, 10 minutes to Los Cristianos and Playa de Las Americas (by car). Towels and linen change weekly. This apartment is looked after by a Local Management company. They will be only too pleased to help you during your stay. Private airport transfers can be arranged. Please note: The website will only allow bookings for a minimum of 7 days. If you require fewer days please contact us directly.